Here is a really neat craft idea using either an old pair of nylons or nylon material you can buy at a local craft store. These flowers are very pretty and versatile in use. They can be used to decorate for a bridal shower or be made into a corsage. They'd be cute sewn onto a denim jacket or a fabric purse. Invite your girlfriends over for an evening of crafts or have a kids craft day. Cut the floral wire into four 6-inch pieces. Hold the film canister in the center of one piece of wire and bring the loose ends of the wire up to meet. Twist the loose ends of the wire around the canister so it makes a round shape. Continue twisting the loose ends of the wire together to make the stem of the flower. Remove the canister and you have the shape for one petal. Repeat steps 2 through 4 three more times. Cut your nylon material into four pieces about the size of the wire loops. Stretch a piece of nylon material over a wire loop and glue to secure the material to the wire. Repeat for the remaining three loops and pieces of material. Place the petals on top of each other. 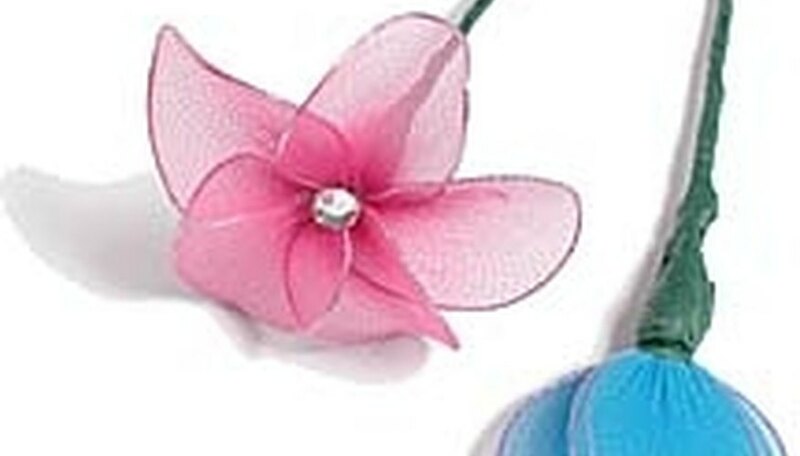 Wrap the floral tape around the base of the petals and continue wrapping down around the wire until you reach the end. This forms the stem of the flower. Open each petal out and shape however you wish to form the flower. Glue a button or bead in the center of the flower. Be thrifty and use an old pair of nylons and dye different colors. Add more petals to vary the size of the flower. Experiment with different size petals.